Workers’ compensation exists to provide benefits for U.S. employees. People that have suffered a work-related injury might be entitled to receive workers’ compensation for the injuries they have endured. The workers’ compensation benefits may include payment of medical expenses and compensation for any lost wages. In addition, workers’ compensation can be paid to an employee’s dependents if they die from a work-related injury or disease. With some very narrow exceptions, the question of negligence (fault) is not an issue if a worker is hurt on the job. Whether or not the employer is at fault has no impact on the worth of a case. If you are injured, you should immediately report the accident. Make sure an accident report is filled out and write down the names of all witnesses. To Learn more about Workers’ Compensation Laws in the State of Pennsylvania contact the Pennsylvania Department of Labor. If you or a loved one has been injured on the job, we offer free consultations in person, via on-line or via telephone at 412.802.6666 or toll free 1.877.744.3476. 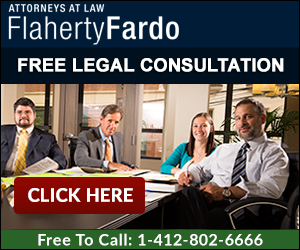 Our representation for Pennsylvania work injury and worker compensation cases is based on a contingent fee structure. There is absolutely no fee unless we obtain recovery for you. We advance 100% the costs, including experts, filings, and depositions and are only reimbursed from the client’s share if we are successful. If we represent you or a loved one in a work injury or worker compensation case, you can rest assured that we cannot make money unless we obtain monetary recovery for you or your loved one.